The bathrooms are decorated w/ tadelakt (artisanal product parrakchi, of limestone base, which means 'to caress'), equipped w/ shower & wc. There are in total 5 bathrooms: 1 included to the Blue bedroom, 1 outside on the ground floor, then 1 outside on the landing of the 1st floor, 1 included to the Red bedroom, and 1 outside located in the terrace, very practical when having breakfast in the covered living room or under the Berber tent, or after sun bathing. The bathrooms are simply decorated. very clean and airy. New! Dar Tiflet riad is equipped w/ Wi-Fi access, for 2 computers (one per floor) w/ web cam for your Skype or MSN contacts, & has a fixed telephone for incoming calls. In winter: additional gas/electric heating + air-conditioning with reverse cycle on 1st floor. In summer: fans on the ground floor, air conditioning on the first. For family evenings, many board games ('Marrakech', naturally, but also 'Dixit', awarded in 2010, 'la Guerre des Moutons', etc). Amongst the kitchen equipment: microwaves, 2 refrigerators, electric kettle, coffee machine and toasters, covers and kitchen materials, vacuum cleaner...On the terrace, the additional kitchen has a dishwasher, iron and ironing board. Of course, you have many books on Morocco, guides or photo albums, to help you in your choice of visits. Thank you for the wonderful hospitality, Yassine and Mohamed. Thank you Patrice for the dessert tour route you recommended. 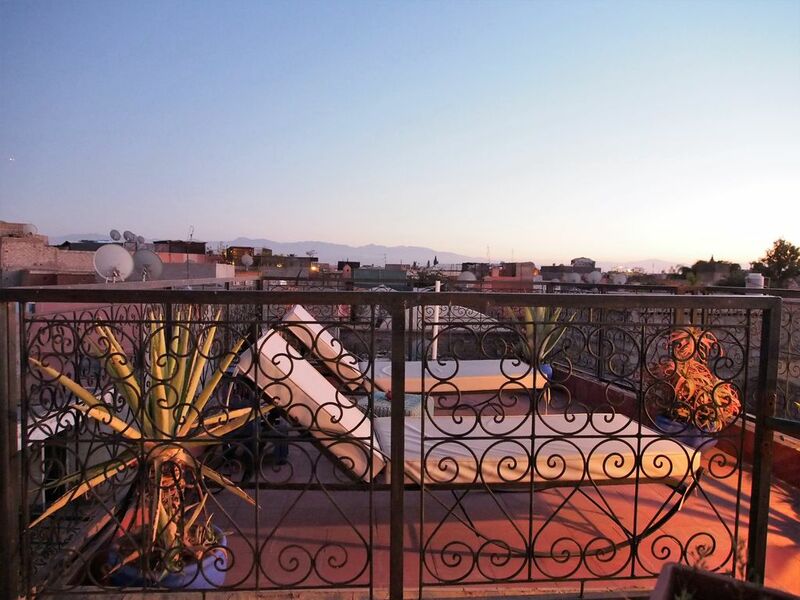 Riad is in a wonderful location, with great terrace and loving cat. Room was sweet and authentic. We enjoyed our stay immensely. The traditional authentic charm of Dar Tiflet was enjoyable. Some lovely rest rooms courtyards, and roof tops to chill and relax. The real strength though of Dar Tiflet was the team who run it. They make you feel very welcome and are extremely helpful. Special thanks to Yassine who spoke good English and helped us in may ways with taxis, walking us the nearest Bank etc etc. The house is located close to the Jemaa El Fna place but in a quiet corner. Easy access and within walking distance of most attractions within the Medina. Very nicely decorated (they are expanding to add a nice courtyard and a few more rooms) with air-conditioning and fans and spacious enough room for 2 people in each room. It was also good respite from the heat. Breakfasts were copious. Marc/Patrice and their team (Rachid and Assyn) were very helpful with their advice and coordination of our needs. We were a group of five females of a wide age range and felt really comfortable and safe at Dar Tiflet. We rented the whole riad with it's 5 en-suite bedrooms being available for all. Dar Tiflet which is situated in the Medina area is excellent value. Marc, the owner, on arrival served us mint tea and then showed us the way to the main square, a few minutes away, and suggested some restaurants where to eat an evening meal. We must thank Marc & his team who were available whenever we required advice. Breakfast at Dar Tiflet on one of the several roof terraces has to be recommended @ €4 each. We visited early April when the weather was fine and the temperatures pleasant so we did not require the heating or air-con that was made available. All in all a very enjoyable experience to remember and we didn't get lost once!! Very personal and cosy athmosphere. Superfriendly hosts who where very helpful. Delicious breakfast. Thank you for taking time to write this friendly review, best regards from all the team ! Notre tarif inclut les taxes locales (taxe de séjour et taxe touristique, 23 dh/jour et par personne soit 2€:jour). Les tarifs sont calculées pour des chambres doubles, deux par deux, si vous souhaitez réserver à 4 ou 5 personnes des chambres single, merci de nous le préciser. Nos tarifs sont identiques toute l'année, pour permettre de partir en vacances scolaire avec le même budget.